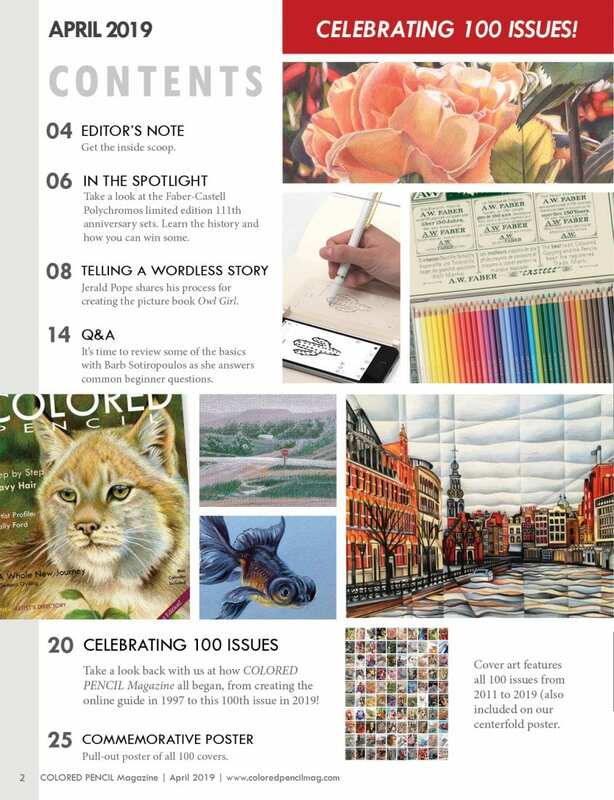 Wow, 100 issues of COLORED PENCIL Magazine are now in print – it only took 8 1/2 years! As I prepared for this issue I had to go through every magazine we created and it was quite a fun walk down memory lane. I am happy to share our story with you on our firsts and failures. To help us celebrate we created limited edition enamel pins, only available inside this expanded April issue! We also added a new bookmark and an 11x17” commemorative pull-out poster. Also inside, 15 very lucky print subscribers will find a red envelope containing either a $100 or $50 coupon to purchase art supplies on the www.dickblick.com website. Thank you Blick Art Materials for your generous gifts! The festivities continue with Polychromos as our Spotlight pencil who are celebrating their 111th anniversary by giving away two 24 piece, collectable, limited edition tins. Learn more about the contest, these sets, and Faber-Castell’s rich history and then take the quiz to win! A while back, Jerald Pope sent us a copy of his wonderful book titled Owl Girl and was gracious enough to share his process of creating a book without words. We have so many new readers that Q&A columnist Barb Sotiropoulos wanted to address some common questions that beginners have – also a great review for any level artist. Taking reference photos is an art of its own and Carrie L. Lewis helps you to understand how to light your subject for better finished pieces. 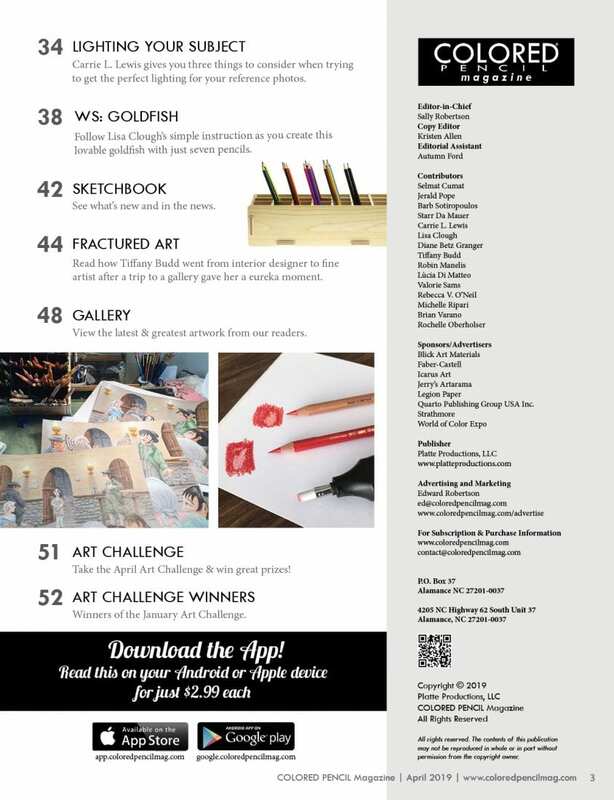 As another special treat this month, we were able to coax Lisa Clough to take some time from her hectic schedule to provide the lesson for this Workshop Series on how to draw her signature animal – the globe eye goldfish. Last, we have Tiffany Budd sharing her amazing fractured art and story of how she developed her unique style. We only thought it appropriate to give you a related Art Challenge and came up with this 100 buttons photo. We tried to hide a few so you don’t have to draw them all, but I think it is colorful and fun and will give you a chance to win some of the $300 in prizes in 3 categories from Jerry’s Artarama. Want even more? Print and digital subscribers are also automatically eligible to win the Book of the month Horses & Ponies from Quarto. As always, you can get 30% off this book for a limited time. See code and details here. Visit www.coloredpencilmag.com/giveaways for more information on all these events. If you are excited to check out some back issues, you are in luck – we are having a big blow-out sale of all our 2016-2018 print issues for just $4.99 each thru April only. Issues that are not in stock are still available through our 3rd party seller, Magcloud at non-sale prices. Sign-up for our newsletter to download the new 2019 Promo issue! Thank you so much for helping us to get here, we are looking forward to the next 100 issues with your support!